This morning I made two batches of pickles using tried-and-true recipes from last summer. These recipes were the two out of four that I made in 2013 that we liked so I knew making these for the pantry would not be a waste of time or space. The first was using the Ball Kosher Dill Pickle Mix that they sell in the stores. I know this is sort of like cheating, but last year was my first time making pickles and I wanted to ease myself into it. 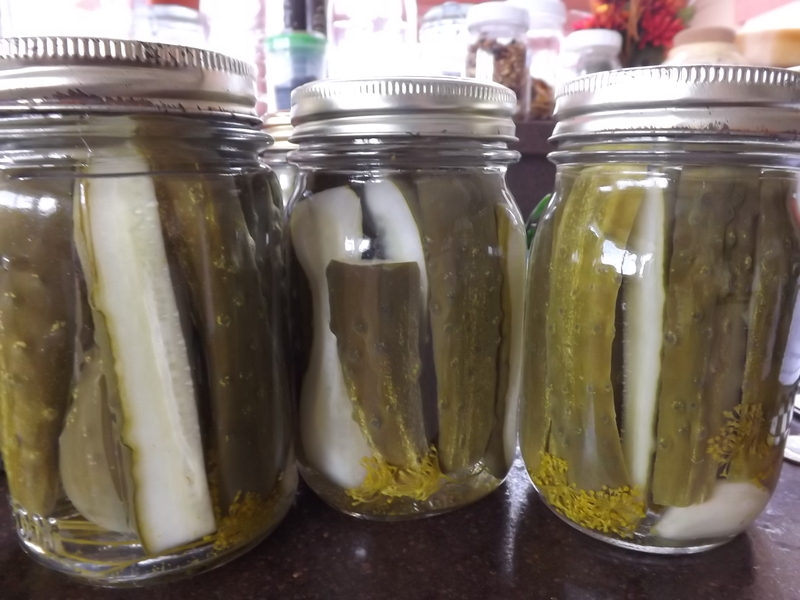 The second batch I made came from a recipe I found on the internet from The Complete Book of Year-Round Small-Batch Preserving for Fast Favorite Garlic Dill Pickles. The only change I made to them was to add the Ball Pickle Crisp granules. Although the pickles were very tasty, they were a bit soggy. I’m hoping that the crisping agent will firm them up a bit. Trim ends of cucumbers. Cut into quarters. Combine vinegar, water, and salt in saucepan and bring to boil. Remove hot jars from canner. Place 1 head fresh dill and 1 clove garlic into each jar. Pack cucumbers tightly into jars. Top cucumbers with heaping 1/4 tsp. Crisping Granules. Pour boiling vinegar mixture over cucumbers to 1/2 inch of rim. Process 10 minutes per pint. This recipe makes 4 pint size jars. 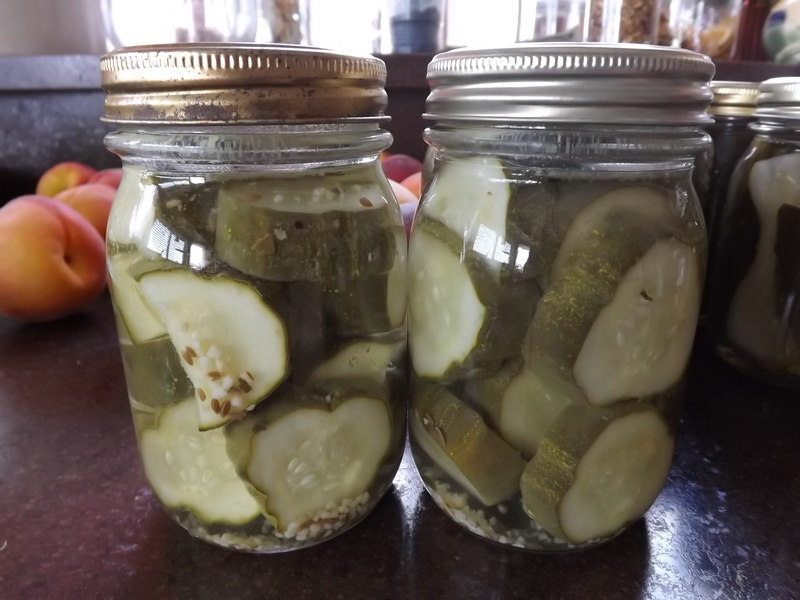 I have several other pickle recipes I want to try, but if I don’t find one that I like better than these two, I will probably make another batch of each. These two recipes used about 2/3 of the cucumbers I picked the other day. The a-frame is still full of flowers and baby cucumbers so next week there will definitely be more for the picking and more for the pickling, and for this I am — Simply Grateful.